Too often, we hear “biscotti” and we think of those plastic-wrapped, rock-hard cookies sold on coffee chain counters across America. But this beloved Italian cookie is not to be overshadowed by ungainly drop cookies. Homemade biscotti are toasty and sophisticated, able to withstand dunking in coffee or tea, but tender enough to be eaten on their own. 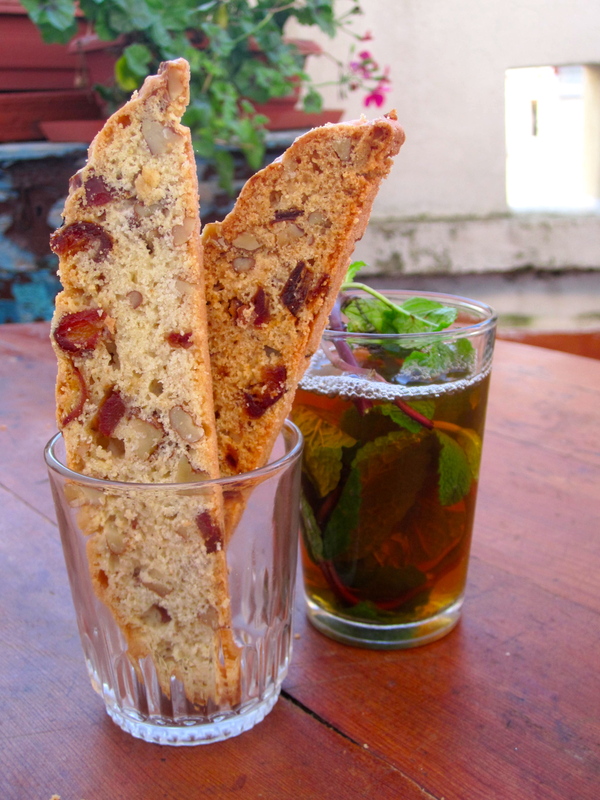 I discovered these biscotti my first winter in Morocco, during which I drank endless glasses of hot mint tea. Needing a companion to dip in my beverage, I decided to make cookies with dates, walnuts, and semolina flour, all ingredients found in abundance in my neighborhood souk. Moroccans would never chop up dates to put in cookies, but this aberration was a revelation- slightly crisp, with pockets of chewy sweetness and crunch, they have a heartier texture from the semolina flour. Plus, they mix up in one bowl, and are easily adaptable. I can imagine adding orange zest, pistachio, chunks of dark chocolate, or drizzling glaze on top. No need for a special occasion to bake these biscotti. Your afternoon coffee will thank you. Grease a baking sheet. Preheat your oven to 350 degrees F.
Stir together the melted butter, sugar, salt, baking powder, and vanilla until blended well. Stir in the eggs one at a time, then blend in the flour and semolina until just mixed. Stir in the chopped dates and walnuts with wooden spoon. Scoop out the dough and shape into a 10 x 4 inch log. The log will spread as it bakes, so make sure there is room on either side. Bake in preheated oven for 30-35 minutes. Cool for 1 hour. Slice the log on the diagonal into 1/2 -3/4 wide inch pieces. Place the biscotti on a clean baking sheet. Bake in a preheated 325 degree F oven for 25-30 minutes, or until golden brown. Allow to cool on the sheet. This entry was posted in Sweet and tagged biscotti, semolina flour. Bookmark the permalink.